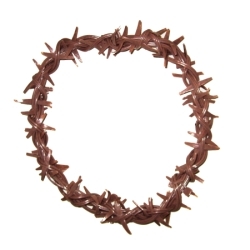 Our crown of thorns is popular with directors and churches for Biblical, Easter, and Passion plays. The Crown of thorns is made of a strand of soft thorns on a rubber branch for comfort. Crown of thorns will fit up to a 23" head head measurement.